Well, I had the best intentions to write this post about 2 weeks ago, but my computer died (yes, flat out died. All I get is a blinking folder with a question mark in it) so Ive been forced to rely on the internet solely at school. Also- if anyone has any idea how to fix my computer, Id appreciate any insights. In addition to my computer, my ipod stopped working back in December and now my camera isn’t functioning properly either. Technology and I are not mixing well here. Anyway, the past two weeks have been pretty interesting and I want to try and get everything in here (moreso my observations/cultural notes than historical ones). A few weeks ago I had the chance to accompany the 11th grade on an overnight class trip to Weimar. First off, never in high school did we get to take overnight field trips so I automatically thought this was super cool. Second, Weimar is an important place for more than one reason so I was glad to have the opportunity to go. (and third, I only had to pay for the hostel since the students’ fees covered the teachers’ tours 🙂 ) Weimar was home to both Goethe (pronounced Ger-tuh. roughly) and Schiller, two of Germany’s most famous writers. Schiller was more of a playwright and is known as ‘the German Shakespeare’. Goethe’s best known works are ‘The Sorrows of Young Werther’ and ‘Foust’, a story about a man who wagers his soul with the devil. We had tours of both Schiller’s and Goethe’s homes, as well as a tour of the city to cap off our time there. And, one last fun fact, Weimar was the birthplace of the Bauhaus art movement (I learned way too much about German art during my class in Munich). The name Weimar may also ring a bell because, after World War I, it served as the place where Germany’s first democratic constitution was signed. This trip also marked my first time into the former East Germany (aside from Berlin) and Weimar was one of the best-rebuilt towns due to its tourist attractions. Unfortunately, some of the other former East-German towns havent fared so well. (I have good pictures to make this post less boring, I promise, they’re just stuck somewhere in the black hole that is my computer). After leaving Weimar we had one more stop to make before heading back home: Buchenwald Concentration Camp. This camp was especially known for hosting foreigners, and at the time it was liberated by the American soliders in 1945, less than 5% of the inmates were of German nationality. Buchenwald wasn’t an extermination camp, technically, but the number of deaths was still astronomical due to harsh living conditions and the fact that it was a work camp. When some people heard I was coming over to Germany, one of the first questions I was asked besides ‘Why Germany?’ was somewhere along the lines of ‘what do the Germans think about WWII?’ In my experience, and from talking to the students I know, the immensity and wrongdoing that occurred during WWII is drilled into students’ heads. They learn so much about it and, quite frankly, I think it’s embarrassing that one of the first, if not the first, thing we still equate with Germany is World War II, not Angela Merkel, soccer, green technology, or even cars for that matter. It would be like a foreigner asking you about slavery, or the genocide of Native Americans every time you said you were American. Those things happened in the past, you weren’t there for them, you know they were wrong, but there’s so much more to your country than just that one horrific event. Imagine not being able to show your national pride, or not having national pride, for a period of around 60 years. It wasnt really until hosting the World Cup in 2006 that Germans could wave their flag proudly, something a lot of Americans fail to understand due to our strong patriotism. In a lesson recently, I explained to a class how we have an American flag in every classroom and every day starts with the Pledge of Allegiance. The students were shocked. Aside from government or official buildings here in Germany, I have yet to see flags waving all over the place. That being said, our trip to Buchenwald was still a very emotional one for both the students and teachers, myself included. There were very few dry eyes by the end of our tour and the immensity of the past did not fail to take hold of us. But, my unintentional rant aside, I urge you to see Germany with new eyes, not through the history books, but focus on what is actually happening today. Germany’s an amazing place with truly amazing people, and I’ve already made some fantastic friends while here. Let’s try and focus on the present and future together, instead of the past. So I realize that in using other people to write for my blog I’ve grown increasingly lazy and haven’t updated in a while. This will just be a short post since I’m off on an overnight class field trip to Weimar tomorrow, followed by a weekend in England. Christmas break was obviously great, and after that I went to stay with a friend of mine from the lacrosse team for a few days. It was really nice to be in a home and we made the most of the rainy weather by installing her family’s new tv and watching lots of movies. Since getting back to school I’ve done a bit more teaching, some on the American school system but the big topic has been the shooting of Congresswoman Giffords from Arizona. In the older grades we’ve read some articles on the event which led to discussions about gun control laws in the US. Here in Germany it’s pretty simple: hand guns are illegal. In fact, the only guns allowed are for hunting and even then there’s a debate going on regarding whether the guns need to be kept at a shooting range instead of locked up in the home. It’s been interesting to criticize and defend my own culture from the outside, especially when required to explain the history behind the need for the 2nd amendment (had to look that one up). Outside of the classroom, I went with a few teachers from the English department to see the University theater group put on a production of “The Importance of Being Earnest”. I’ve never read the play by Oscar Wilde, but really enjoyed the show and thought the actors did a great job, especially as English wasn’t anyone’s native language. Aside from school, I finally moved into my new apartment! It’s beyond wonderful (especially in comparison to my prior living arrangements). My room came fully furnished as I’m only a sub-letter, and my roommate is super nice. Not to mention that she’s German which requires me to practice my German even more. Now that I’ve got a fully functional kitchen my goal is to learn how to cook, but don’t cross your fingers. Last weekend I went to Heidelberg with my friend Nadiya who, as you loyal readers surely remember, is on a Fulbright up in Kiel. There was the Fulbright “winter ball” which in my opinion, was a little too expensive for an average dinner. But we did meet a really nice couple who sat at our table for dinner and had actually met at the Fulbright winter ball six years earlier (they were both German. The Fulbright commission also provides scholarships for those from other countries to come to the US either to study, teach, or act as a teaching assistant in their native language). 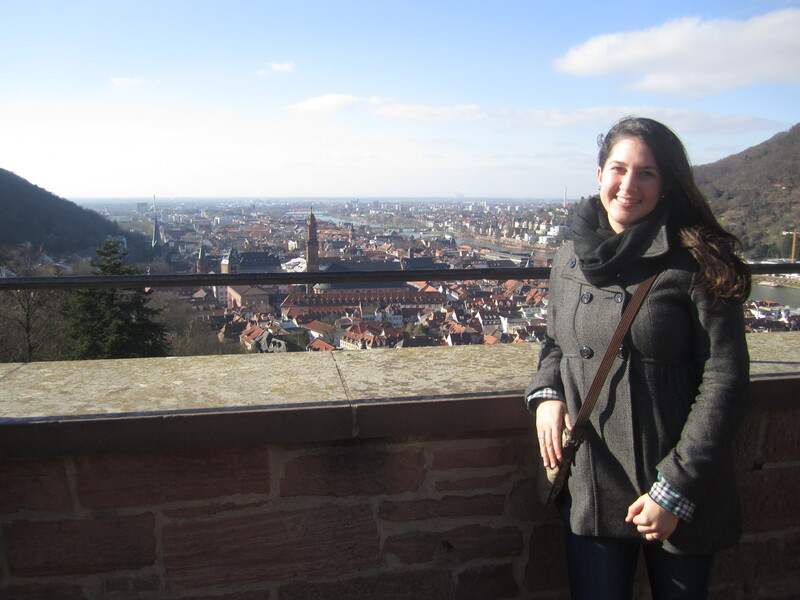 Nadiya and I took advantage of our time in Heidelberg (where Nadiya studied abroad during her time at BC) and I got a full city tour, complete with walking up to the Schloss (castle) and over the oldest bridge in Germany. Let’s hope the country continues to listen to what the people want and support them as they demand change.